With a combination of burly fabric and strategically placed insulation, our Insulated Powder Bowl Jacket keeps you warm, provides tough, long-wearing waterproof/breathable and windproof protection, and does it all without compromising mobility and weight. With a refined fit and streamlined styling, it’s built with a tough 2-layer Gore-Tex® fabric, made from tenacious 100% recycled polyester, for durably waterproof/breathable and windproof protection in all conditions. We treat the shell with a DWR (durable water repellent) finish to stop moisture and wet snow and increase abrasion resistance. A body-mapped combination of compressible 100 g and 60 g Thermogreen® insulation traps your heat and provides lightweight, efficient warmth that stays warm even if wet. Inside, a 100% polyester lining increases durability, adds an easy glide over layers to keep you moving freely and manages moisture when you work up a steam. The removable, 2-way-adjustable, helmet-compatible hood has a laminated visor for optimal visibility in ugly conditions; a tall collar protects your face and neck from freezer burn. 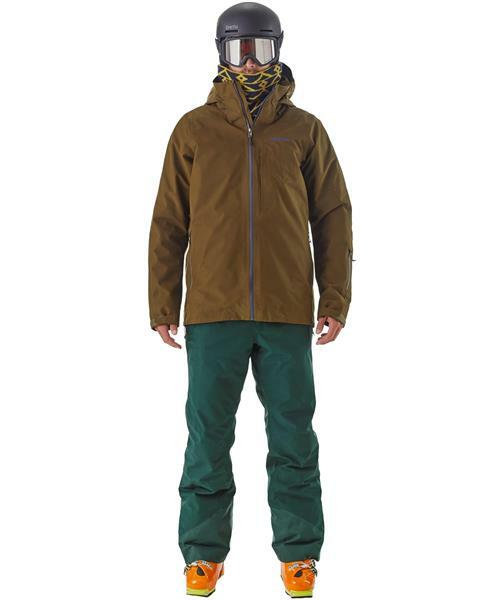 Finer points include a fully adjustable powder skirt; pit zips; watertight, coated zippers with slim zip installation to reduce bulk and weight; cord-lock adjustments at the hood and hem; and an embedded Recco® avalanche rescue reflector. Pockets: two handwarmers; one chest with secure media pocket (and cable routing); one forearm pocket; two interior pockets (one drop-in, one zippered stash).